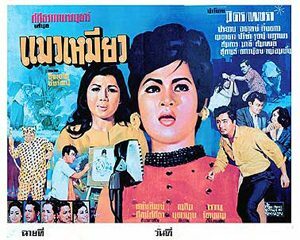 Tut Tu / ตุ๊ดตู่ is a Thai movie released in year 1967 with Mitr Chaibancha and Sopha Sataporn. It is a lost movie in Thailand. Only a 2mn30s sequence is left. Other actors include Daonoi Duangjai, Malee, Malee Wetpraseri, Mom Chan Phuangwan, Kingdao Daranee, Prachuap Ruekyamdee, Sukon Koewliam, Somkuan Krajangsat, Adul Dulyarat, Metta Roongrat, Kaenjai Meenakanit, Ruj Ronnapop, ruffians Tat Ekathat (ทัต เอกทัต) and Sompol Kongsuwan. Sopha is called Tut Tu. Somebody asks for the hand of Tut Tu as a wedding procession (ขบวนแต่งงาน) is seen. She flees to Bangkok. The movie summary is still available thanks to some very old Thai stars magazines. 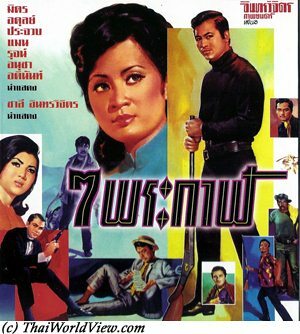 Thai movie ไฟเสน่หา was released in year 1967. It features Mitr Chaibancha as main actor and Petchara Chaowarat as main actress. This movie is lost in Thailand and only a 13s sequence is left to be seen. During the short sequence Mitr and Petchara are seen on a raft. Veteran actor Adinan Singhiran can also be seen. On the movie poster, 18 Thai stars are announced, i.e. Mitr Chaibancha, Adinan Singhiran, Ruj Ronnapop, Sukon Koewliam, Sompong Phonmitr, Joomjim Khemlek, Preuhat Boonlong (สาหัส บุญหลง), Petchara Chaowarat, Metta Roongrat, Preeya Roongrueng, Kaenjai Meenakanit, Orasa Isarangkul, Chosri Misommon. This part of the second part of the "The Conqueror of Ten Directions" trilogy. Sadet (จะเด็ด) starts to be also named as Buren Nong (บุเรงนอง), his future name as a King. Sadet (จะเด็ด)(Chaiya Suriyun) is now staying in the kingdom of Phrae. Prince Sopinya from the kingdom of Hongsawadee is coming for an official visit to the kingdom of Phrae. Katima (Metta Roongrat) is also in Phrae. She is doing sword street performances to make a little money as she lost her purse. Khairoo, head of Hongsawadee swordmen, wishes to buy Katima's sword and has arguments with her. A soldier helps Katima. Katima is dressed like a man. Sadet doesn't recognize Katima and befriends with her. Sadet still uses sweet words with various princesses. Arguments happen between Sadet and Sopinya. Sadet succeeds to have Khairoo judged for malversation causing Sopinya's ire. The king of Phrae uses Sadet as councillor. Sadet is called under the name of Wang. Following Sopinya's bad influence, the king of Phrae finally decides to arrest Sadet. Sopinya proposes to the king of Phrae an alliance against the kingdom of Taungoo. Princess Kusuma (กุสุมา)(Pissamai Wilaisak) tries to warn Sadet and finds Katima in Sadet's room. It is too late. Sadet is imprisoned. Mangtra's help is needed. Mangtra is now the king of Taungoo. Taungoo's army besieges Phrae but needs to retreat. Taungoo's army is swapped away as night time in their encampment. 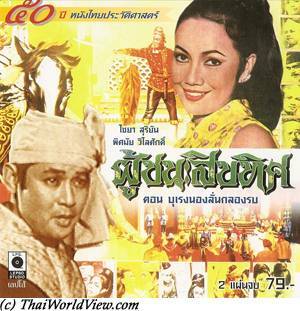 Hongsawadee henchmen brings troubles during the blocus and Sopinya convinces Kusuma to follow him. Sopinya takes advantage over Kusuma while she is sleeping. Meanwhile taking profit of the mess, Katima succeeds to free Sadet and the other prisoners following fierce fights. Mangtra is angry with Sadet and claims he is a traitor (ทรยศ) as he stayed with Phrae instead of Taungoo. He threatens to cut his head following the 40 000 soldiers, who died for nothing. Hopefully the old monk can interfere and saves Sadet offering his own head as a guarantee. Sadet is ordered to seize Phrae and is offered 60 000 soldiers but he only requests 20 000 soldiers. If he fails, his head will be cut. Sadet wins a first battle over a fort on the way to Phrae thanks to a better strategy. Learning that Kusuma has been sent to Hongsawadee, he leaves the army and decides to go there. Sadet gets the confidence of king of Hongsawadee while Sopinya is away. Kusuma still loves Sadet and wishes to die as Sopinya forced her. A fire is provoked in Hongsawadee by Sadet's henchmen. Sadet steals Sopinya's boat and takes back Kusuma with him. The second opus features an impressive performance by actor Chaya Suriyun. The movie continues to mix romance and historical characters. This is the last opus of The Conqueror of Ten Directions trilogy. Sadet receives armors and award from Chantra, king of Taungoo kingdom. Chantra, Chantra's sister, still loves Sadet. Kusuma, Phrae kingdom princess, who also loves Sadet, hears everything and leaves for Phrae kingdom. Despite honors given, Mantra is still unhappy with Sadet, following the former military defeats but can do nothing against Sadet as he is seen as a soldier with many virtues (ทหารบารมี). Sadet comes back officially to Taungoo kingdom. The monk mentor protects Sadet as Mantra has still not decided what to with Sadet. Recently Mantra indulges in alcohol. The two men are angry against each other. The war is still ongoing between Hongsawadee and Taungoo kingdoms. Sadet decide to ordain (บวช) to wash his sins and mistakes. Chantra visits him before ordination. They declare their love towards each other once again. Chantra refuses that Sadet ordinates as the kingdom is on war. Sadet captures Khairoo, head of Hongsawadee swordmen. Then Sadet visits Kusuma in Phrae kingdom. Sadet wishes to take Kusuma to Taungoo kingdom. Sadet wants to have both ladies, Chantra and Kusuma, as wives. Khairoo, head of Hongsawadee swordmen, flees from jail and kills the monk, who was the mentor of Sadet and Mantra. Sadet decide to destroy Hongsawadee kingdom as retaliation and defeats their army. Sopinya, Hongsawadee kingdom prince, and Khairoo make an alliance with another warlord to fight Taungoo kingdom. Sadet captures the warlord. The warlord changes alliance and Hongsawadee city is definitively destroyed. Mantra defeats and kills Hongsawadee's king (พระเจ้าสการะวุตพี). Sopinya and Khairoo pay for their sins and are killed. Sadet is also loved by another lady called Katima, who is commoner. Unfortunately seeing that there is no way she can get Sadet's love for her alone, Katima gets suicide. Mantra finally renunciates to the kingdom and Sadet becomes the new king of the three unified kingdoms. The whole trilogy is more than 7 hours long. Even if the 3 VCDs are full, the original movies were in fact cut to fit the VCD format, which means 2h30mn maximum. What a pity Lepso company never releases them in DVD format! A mysterious Dakota airplane drops a big parcel in the sea, containing in fact the ruffians leader (หัวหน้าใหม่) called Adamcha (Kecha Plianvithee). Meanwhile two Royal Thai airplanes intercept the plane forcing it to land at Don Meuang airport. Thai Army is then aware that a mysterious organisation is preparing plans to harm Thailand so Thai army chief asks his officers to do their best to protect Thailand, Buddhism and the King. Police inspector (สารวัตร) Chet (Mitr Chaibancha) needs to help also and to find an agent called double X. Double X is in fact a police woman called Chin Chin. Adul (Adul Dulyarat) steals some documents in governmental building. Amara (Amara Asavananda), a young lady, supports Adul as part of the organisation. The secret organisation (ผู้ก่อการร้าย) brings disorder in Thailand through bombs and Thai police seems unable to stop them. Chet follows Adamcha's car but gets captured when entering in Adamcha's house. The police chief asks another policeman to help, i.e. Chet's younger brother called Sombat (Sombat Methanee). Real actor names are used in this movie as anyway it was a 16mm movie with dubbing. During an evening party to celebrate their bad achievements, double X's team kidnaps Amara and asks for a ransom. Adul follows the police ladies and after being summoned by Chin Chin (Audrey Sing) regarding his treacherous behavior over Thailand, he accepts to change side. He works for the organisation because of his love for Amara. Sombat helps to release Amara and shoot some policemen (แสดงหนัง). Sombat is finally accepted in the secret organisation following a test. A bank attack turns to a fiasco as police was aware. 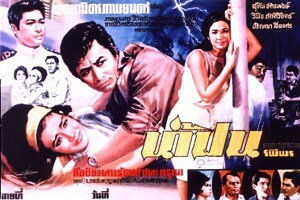 Sopha (Sopha Sataporn), Sombat’s love, is injured. It seems there is spy in the organisation. Sombat helps his brother Chet to flee. Chet is back to the house with full Police squad but Adamcha and his clique have already left. Chet succeeds to get the plan of their new retreat but the ruffians, seeing army soldiers, retreat to a well hidden place. Adul provides the location to the police but is identified as traitor. He is imprisoned and refuses any help from Amara, his former love. Police and army storm the hidden place of their organisation. Following various shootings and Adul's sacrifice, the secret organisation is vanquished. 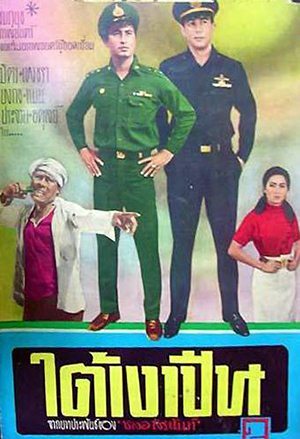 It is another nationalist 1960s movie with police and army protecting Thailand against external threats. 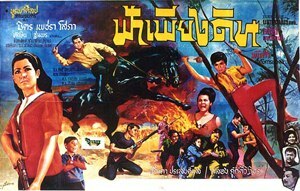 The picture quality features many red and green lines (เส้นฝนตกมาก) as company Phanmitr has used the latest film reels available for this movie, which was very popular in 1960s. 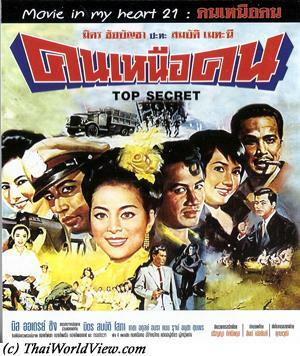 คนเหนือคน (Top Secret) is a 2h15mn movie. It is also features a few popular songs including a duo Sombat and Sopha. ทรชนคนสวย is a Thai movie in 35mn format and lasting 2h20mn. It should even be longer as some parts of the film are missing. It seems it was never released in VCD or DVD format but only in VHS format. 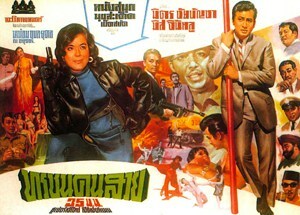 ทรชนคนสวย is a spy genre movie from 1960s. Such movies follow the popular trend traced by James Bond 007 films. ทรชนคนสวย still has a nice and colorful picture. Vichien, the boss of a secret organisation, is seen as a traitor and fired. A big amount of drugs worth 100M baht has disappeared. Pusit (Somkuan Krajangsat) is a military officer looking for it. Police is also looking for it. Vichien's best friend in the organisation kills him. Vichien's daughter Lin (มิสจิ้นหลู - นางฟ้า from Taiwan) is living in Hong Kong. She wishes to understand why her father was killed. Reung (Mitr Chaibancha), a former policeman, meets her in a hotel. Cheng (Man Teeraphol) contacts Reung to buy the plan guiding to the hidden drug versus a 20M bath price. As Cheng got only half of the money, he gets only half of the map! Suriyan (Ruj Ronnapop) is a policeman. Lin (น่ารัก) listens to Reung and spies his room (แอบฟังอยู่) but she gets discovered by him. She wants to buy the map also. Meanwhile Cheng discovers that sympathetic ink has been used for the map he just bought! Reung shall meet Lin in a nightclub located in Kowloon. She is singing there. Two songs are featured (ปากของคุณน่าจูบจังเลย). Reung and Ruj need to flee the nightclub as Cheng sent a bunch of ruffians there. Back to Bangkok, Reung loses a bet to a mysterious Indian guy wishing to get his clothes as the map is inside. Following a fighting in the casino, Reung flees wearing underwear only and riding a motorbike with Lin. Reung has many enemies. Ruffians try to get back the drugs worth 100M bath (ฝิ่น). Lin is going to Songkla and shall meet Reung there. Ruffians and police are on the way to Songkla also. Suda (Orasa Isarangkul) pretends a car failure to meet Reung. She is dangerous (ปีศาจ) and is working for the secret organisation (ถึงอาบคงไม่หายความร้อน / ยินดีเสมอครับ). Meanwhile Lin is drugged in the train by Lin's father former best friend. She is saved by Pusit. The opium is hidden under Vichien's grave. Overcoming danger and traps, Reung and Pusit succeeds to enter under the grave and release Lin. Ruffians flee by submarine but it is sunk by Thai army rapid boats. Reung and Lin get married. This movie is directed by Mom Ubon Yukol who is a Thai prince and father of famous Thai director Chatrichalerm Yukol. This movie is based on a famous Thai poem. This movie is about the love between lady Daralai (ดาราราย) and a King named Ayarawat (อริยวรรต). Ayarawat has a brother called Katiya (ขัตติยะ). Ayarawat has seen a beautiful lady in his dreams and want to see her in real. They disguise as commoners to see ladies in Paransee (พาราณสี) kingdom. Indian clothes style and music remind a little bit of Bollywood movies. Ayarawat imitates a blind Brahmin (พราหมณ์) and is named as Wipha (วิพาหะ). An earthquake (แผ่นดินไหว) disturbs a sacred (บูชา) ceremony. Daralai (เจ้าหญิง) receives help from Wipha to avoid crowd stampede. She stays with the commoners until the royal guards find her back. Wipha requests kisses to recover his sight view. There is love between Daralai and Wipha but she is promised to another man already. Katiya meets also another princess called Apasara (อาภัสรา). Daralai loves Wipha. She finally discovered that he is a King of a rival kingdom. She has to choose between love and fidelity to her own kingdom. She doesn't like Ayarawat's behavior. Ayarawat (อริยวรรต) is captured by Paransee kingdom's guards but is freed by his brother. Ayarawat kidnaps Daralai but his brother is captured. Ayarawat is hot temper. He is ready to a war with Paransee kingdom if his brother is not freed. To avoid a war between the two kingdoms, Daralai declares she doesn't love Ayarawat anymore in order that Ayarawat agrees to exchange her with Katiya. Finally Katiya gets freed by princess Apasara but doesn't come back on time to prevent the exchange. Disappointed by Daralai, Ayarawat decides to marry to Princess Apasara. Daralai is back but learning that Ayarawat has a new queen, she leaves. Understanding his mistake, Ayarawat decides to invade Paransee kingdom to get back Daralai. Ayarawat is injured and died when looking for Daralai. They are both reunited in heaven. Katiya becomes the new king. 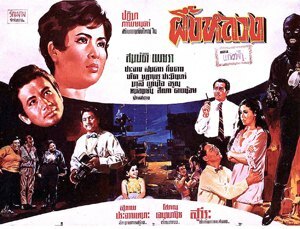 Thai movie โป๊ยเซียน was released in year 1967. Main actors and actresses are Mitr Chaibancha, Petchara Chaowarat, Somjit Sapsamruey, Lor Tok, Sukon Koewliam, Prachuap Ruekyamdee, Preeya Roongrueng, Preuhat Boonlong, Op Boonthit, Pramin Jarujareet, Malee Wetpraseri, Joomjim Khemlek. Movie director is Neramit. The movie is lost in Thailand but a sequence in 16mm format can still be seen. It lasts twelve minutes and features colorful sequences. The remaining sequences allow to see Mitr and Somjit Sapsamruey playing his mother. The house owner wishes to chase them. Lor Tok gives money to calm her down. He also brings food to Mitr and Somjit. Mitr and Lor Tok are doing multiple jobs such as cleaning clothes, working in hairdresser shop... A customer arrives. It is first time for Mitr to cut hair so it is disaster. Mitr finally works as assistant in a photographer shop. He is fired again but the shop owner has pity and helps him. The remaining sequences show Mitr wearing prince clothes, Petchara crying, Mitr being reunited with his mother Somjit. A spirit Nang Fa Thani (นางฟ้าตานี) has done mistakes in the Gods heaven, so she is condemned to stay on earthy world and to live in a banana plant tree. She is fond in love with a man called Thap. Thap previously loved a lady called Theva. Nang Fa Thani used artifacts to get Thap's love. Thap faces issues with a group of bad people. Those, believing that Nang Fa Thani hides a treasure inside the banana tree, decide to cut the tree causing the death of Nang Fa Thani. She then becomes a powerful ghost called นางพรายตานี, chasing and killing those who have cut the banana tree. She then wants to stay with Thap but it is not possible as she is a ghost. Seeing the interest of Theva into Thap, she threathens to kill all villagers. She finally accepts her death following a monk's mediation. Seven convicts (ผู้ต้องหา) are inside a van. Their van has a crash so they can successfully escape. They have all different characters, i. e. Dam Prasakorn (ดามพ์ ดัสกร) a car robber, Tong Bai (ทองใบ) a former traditional folk singer (พระเอกลิเก), Han Meuang Tong (หาญ เมืองทอง), Ai Meut (มืด ธรณี), Khom (คม) a tireless card player, Boonmee (บุญมี) a gunman (มือปืน), Phayak (พยัคฆ์). Police is chasing them so some of them are stealing motorbike, car or horse to flee away. Han Meuang Tong, son of a village headman (กำนันเหิน), is having issues with local mafia leader Saen (พ่อเลี้ยงแสน). Saen accuses Han Meuang to have killed his younger brother ten years ago. He wishes to take revenge and sends ruffians to kill him in his hotel. Paeng - 1960 cliche of small virtue lady featured with a cigarette - is supposed to seduce Han Meuang while Pol shall shoot him. It fails and Pol is captured by police thanks to Han Meuang and Thong Bai. Han Meuang's father is unhappy with his son (เสือร้าย) and wishes to kill him as he is now a convict (โจร). Soi (สร้อย), daughter of Saen, helps to hide Khom in her room and asks her father to recruit him. Sia (เสี่ยมังกร), another local mafia leader involved in illegal sawmills, wishes Han Meuang to join him but Saen's ruffians injure Han Meuang following a trap. Saen’s ruffians terrorize the villagers to find where Han Meuang is hiding. His sister is even kidnapped. Han Meuang needs to fight back (สู้). A mysterious masked leader (นายอนันต์) reunited the seven fugitives (7 พระกาฬ) together and also all Saen / Sia ruffians. He needs them for a secret mission. They need to get a cargo of weapons to be sold illegally. But police is aware and tries to catch them. There is a police spy within the seven guys (มีหนอนบนไส้). A police inspector is captured to find who the spy is. It is Dam Prasakorn (กรมสืบราชการ). The police inspector (สารวัตร) finally succeeds to flee and it is discovered that three of the former fugitives are working for the police. Han Meuang, wishing to help Thailand, helps to release them. Traitors to Thailand (ทรยศขายชาติ) shall be stopped. Many fights and shootings are happening between the four men and the traitors. Police intervenes also. Ruffians are all killed and their leader's helicopter is shot down by Han Meuang. Finally Han Meuang is an undercover soldier (กองทัพ) so he reconciles with his father. There is moralist ending as Tong Bai also surrenders to police and gives back the money left in a suitcase by the ruffians. This movie includes a mix of action and comedy. it features a beautifully restored colorful picture and lasts 2h21mn. It reminds of 1954 “Seven Samurai” Japanese movie or 1960 “The Magnificent Seven” American movie. 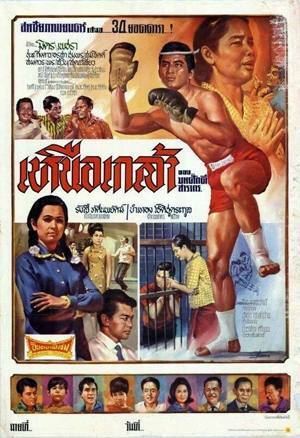 Another Thai movie named “7 พระกาฬ” was released in 1983. 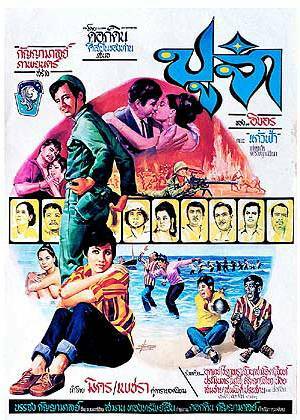 Thai movie สายเปล was released in year 1967. It features main actor Mitr Chaibancha and main actress Petchara Chaowarat. Other actors are the mother Malee Wetpraseri, Sukon Koewliam, Prachuap Ruekyamdee, Choomporn Theppitak, Sompong Phonmitr, Lor Tok, Taksin Jampol. The family drama movie is lost in Thailand but a 4mn30s trailer remains to be seen. Mitr and Petchara are playing young and adult roles (through a trial). Mitr meets Petchara for the first time when she performs as a traditional dancer. They start to better know each other during Loy Krathong festival. Petchara can be seen taking care of a baby. It is not known who are the baby parents. There is also a sequence of Mitr as a lawyer is taking defense of Petchara. The story is the same as movie นี่หรือมนุษย์ (1982 remake of movie สายเปล). Petchara plays Boonleuang (บุญเรือน เกตุแก้ว). Mitr plays lawyer Cheut Ayakowit (เชิดชัย อัยโกวิทย์). สรายุทธ plays the prosecuting attorney Sak (ศักดิ์), son of Cheut and Boonleuang. อุไรวรรณ plays Saichai (สายใจ) stepchild (ลูกเลี้ยง) of Boonleuang. Malee plays the Cheut’s mother (คุณหญิงแม่). This movie was shot in two weeks only. Surayut-Chaiyayut Vetchayan received a salary of 8000 baht to play in this movie. 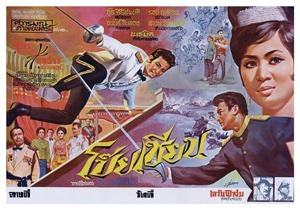 Thai movie เมขลา was released in year 1967. 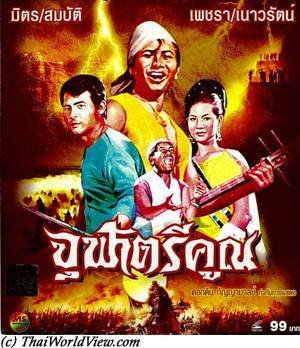 It features Sombat Methanee as main actor and Pissamai Wilaisak as main actress. Director is Cherd Songsri. The movie is lost in Thailand but a sequence of 23 minutes is left to be seen. It is a drama movie. Other actors are Adul Dulyarat, Pawana Chanajit, Choomporn Theppitak, Lor Tok, Sompong Phonmitr, Daonoi Duangjai, Mom Chan Phuangwan. The summary is a below. A Japanese lady called Mitsuko (Pissamai Wilaisak) meets and loves a Thai man (Adul). He goes as a diplomat to Japan. They have a daughter called Mekala (Pawana Chanajit). Adul needs to go back to Thailand and bring Mekala also. Pissamai shall follow up later. Unfortunately Mitsuko gets irradiated by the nuclear bomb sent previously by USA on Japan. Her face is disfigured. When she finally arrives in Thailand, Mitsuko finds Adul has remarried and has another daughter. The new wife and her daughter keep trying defaming Mekala as they are jealous that Sombat (Sombat Methanee) is more interested in Mekala. Mitsuko is ashamed of her new appearance so doesn’t dare showing up. The new daughter find evidences that the disfigured lady is in fact Mekala’s mother and uses this information to humiliate Mekala. Mitsuko tries to reject the accusations and through an accident the new daughter loses her life. The new wife accuses Mitsuko to have killed her daughter. Truth is revealed during the following trial. Sompong Phonmitr and Choomporn Theppitak are playing lawyers. During the trial Sombat as witness is disclosing some truth that Mekala is the daughter of Mitsoko. Mitsuko is cleared and Adul hires the best surgeon to heal Mitsuko. Finally happiness is back as Adul and Mitsuko are back together. Sombat marries Mekala. 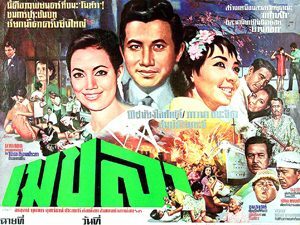 Thai movie เหนือเกล้า was released in year 1967. It is in mute mode as the film is in 16mm format so requesting live dubbing. 1h33mn is left to be seen. It still has a colorful image but the film is partially damaged. Somjit (Somjit Sapsamruey) is working as food street vendor (แม่ค้า). Her husband (Somkuan Krajangsat) is often drunk and violent. They have three kids. They have always financial problems as the father drinks a lot. Years have passed and children have grown up. One of them is Mitr Chaibancha. The others are Chana Sriubon and Choomporn Theppitak. Sompong Phonmitr is head of Thai boxing training centre. Lor Tok is his assistant. One day as the drunkard father asks for money, he becomes violent again and Somjit has to protect herself with scissors. Through an accident, the father receives a fatal injury. Somjit ends up in jail. Mitr, Sompong and Lor Tok leave and look for job to find money to pay for Somjit’s bail. Mitr is recruited as Thai boxer. A first match versus Adinan Singhiran happens. Petchara Chaowarat and Dokdin Kanyaman are part of spectators. Mitr finally wins the match despite being told to lose it as he needs money to help his mother. As the match maker refuses to pay, it ends up in another fighting. Preuhat Boonlong decides to hire the three men to working in an outdoor mine. They got troubles with two men in the mine. Fed up the three friends wish to quit the job but Preuhat Boonlong convinces them to stay. The mine is attacked. Mitr pushes back the aggressors but is injured so getting the sympathy from Petchara. The mother is finally released from prison. Kingdao recruits her as domestic helper. Her boyfriend is Choomporn. Finally the mother is also reunited with Mitr. Another attack happens on the mine and Mitr is accused of murder. It ends up to trial. Scolded by his mother, Chana finally gives information that Mitr is not guilty. Ruffians wishing to take revenge on Chana and try to shoot him. The mother interposes herself and gets shot. Mitr and his brothers catch the ruffians. Movie ends up with everybody around the mother's bed at hospital. 34 stars are announced on the movie poster! 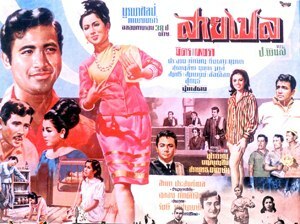 Thai movie ไทรโศก was released in year 1967. It is directed by Wichit Khunawut. It lasts 2h06mn. Yen (Boosara Narumit) is being raised since childhood by a stepfather but was never officially adopted. Bai (Mitr Chaibancha) is a dumb and a bit retarded adult (เด็กวัด) accompanying the monk during morning alms. Kitty (Adul Dulyarat) is the real son. Adinan Singhiran is helping for everything in Thorasok domain. The father is sick. Urai (Namgneun Boonnak) is pregnant with Kitty. Usa (Marasri Bangchang) is Urai's mother. Bai is named as ผีทะเล. Kitty is always upset with Yen. The father finally dies and the testament is opened. It is a shock for the family to learn that no money is given to Kitty if he doesn't marry Yen and have a child with her! The mother and Urai are upset. The mother prepares the wedding of Yen and Kitty to follow the testament. But it is a forged plan. They drunk Bai so that Bai enters in Yen's bedroom at nighttime. Yen becomes pregnant. Kitty goes to live with Urai in Bangkok. A child is born from Yen. The mother names it as Ying Yong and takes it to Bangkok to raise it. Meanwhile on countryside, some ruffians shot a couple and a baby is left behind. Yen decides to adopt and raise the baby. Many years have passed. Kittikorn, son of Urai and Kitty, tries to seduce Dao (Sopha Sataporn), Yong Yot’s daughter. Ying Yong (also played by Mitr Chaibancha) is younger brother (น้อง) of Kittikorn. Kittikorn is insolent (ทะลึ่ง) and lazy. The daughter of Yen, called Srai Gnam (รักชนก จินดาวรรณ), is now a doctor. The man who killed the two parents many years ago is now released from jail. His son is Thep (Choomporn Theppitak). He spent 20 years in jail. He wishes to get revenge over Yong Yot who sent him to jail. Dao sees that Srai Gnam is wearing same pendant as her. Ying Yong and Dao are close together so Kittikorn realises he has no chance with Dao so his parents think about Srai Gnam who is a doctor. Thep befriends with Kittikorn. Ying Yong meets Bai but doesn't realize Bai is his father. Kitty wishes his son Kittikorn to marry the daughter of Yen. Yen refuses. Kitty loses his nerves so hits both Yen and Ngam Sai. Before Ying Yong can do anything, Bai intervenes and punches violently Kitty. Kitty becomes half paralyzed due his fall. Ngam Sai as doctor treats him. Ying Yong realises the kindness of Ngam Sai. The grandmother now wants to have Ying Yong to marry Ngam Sai. Urai cannot support this and tells the truth about Ying Yong to her son Kittikorn. She then quits Kitty and goes back to Bangkok. With the help of Kittikorn and Thep, the ruffians wish to storm Thorasok domain and gets the 200 000 baht stored there. Kittikorn wants them to kill Ying Yong also. Kittkorn hits Dao (หลานสาว Yong Yot) and kidnaps her. Meanwhile ruffians attack the house at nighttime (ถูกปล้น). Bai is killed by Kittikorn (ชาติชั่ว). Kitty is shot during the fighting and discloses the truth to Ying Yong before dying. Ngam Sai is identified as second daughter of Yong Yot. As it turns badly, Kittikorn escapes and wishes to flee with Dao. Dao shots Kittikorn and becomes crazy. Peace can finally happens in Srai Sok domain. Some mute sequences lasting 16 minutes haven't been released on the DVD. Maybe because the dubbing was missing for those parts? Maybe the VCD and DVD versions had to last the same time? Those sequences show the baby found by Adinan, Kitty having heated discussion with his mother and Adinan, Yen treated as a domestic helper by Kitty and Urai, Bai carrying big jar, Urai and Kitty showing their son to the mother, Kitty and her mother in front of the father’s corpse, Kittikorn punching Ying Yong.